Of the countless threats of violence, made by Arab and Palestinian leaders in the run up to and in the wake of the November 29, 1947 partition resolution, none has resonated more widely than the warning by Abdul Rahman Azzam, the Arab League's first secretary-general, that the establishment of a Jewish state would lead to "a war of extermination and momentous massacre which will be spoken of like the Mongolian massacre and the Crusades." This threat is generally believed to have been made during a briefing to the Egyptian press on May 15, 1948, shortly after the pan-Arab invasion of the newly-proclaimed state of Israel. Some scholars trace it to a May 16 New York Times report, citing the Egyptian daily al-Ahram. Yet this New York Times edition contains no such item, whereas the original al-Ahram report has yet to surface. Others cite a BBC broadcast as their source, yet a comprehensive examination, completed by Efraim Karsh, of the corporation's archives in Reading, England, has found no evidence of this broadcast. Others, like the renowned American journalist, I. F. Stone, who covered the saga of Israel's birth as it unfolded, simply noted the threat without proper attribution. But was "extermination" their war aim, as Karsh would have it? There is no knowing. Indeed, the Arab leaders going to war in 1948 were very sparing in publicly describing their goals and "exterminating" the Jews never figured in their public bombast. I myself in the past have used the one divergent quote, by Arab League Secretary-General Abdul Rahman Azzam from May 15, 1948, in which he allegedly spoke of a "war of extermination" and a "momentous massacre" à la the Mongols. But in my recent history of the war, 1948 (Yale University Press, 2008), I refrained from reusing it after discovering that its pedigree is dubious. Yet, the original document does in fact exist. It has eluded scholars for so long because they have been looking in the wrong place. In his account of Israel's birth, Stone alluded to the possibility that the threat was made on the eve of the U.N. vote on partition, with the aim of averting this momentous decision, rather than before the pan-Arab invasion of Israel six months later. Following this lead, David Barnett found a Jewish Agency memorandum, submitted on February 2, 1948, to the U.N. Palestine Commission, tasked with the implementation of the partition resolution, and yet again to the U.N. secretary-general on March 29, 1948. (6) … The "practical and effective means" contrived and advocated by the Arab States were never envisaged as being limited by the provisions of the Charter; indeed, the Secretary-General of the Arab League was thinking in terms which are quite remote from the lofty sentiments of San Francisco. "This war," he said, "will be a war of extermination and a momentous massacre which will be spoken of like the Mongol massacres and the Crusades." 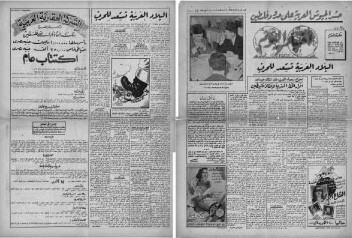 The Jewish Agency memorandum cites an October 11, 1947 article in the Egyptian newspaper Akhbar al-Yom as the quote's source. An examination of the original article readily confirms the quote's authenticity, laying to rest one of the longest running historiographical debates attending the 1948 war. "I personally wish that the Jews do not drive us to this war, as this will be a war of extermination and momentous massacre which will be spoken of like the Tartar massacre or the Crusader wars. I believe that the number of volunteers from outside Palestine will be larger than Palestine's Arab population, for I know that volunteers will be arriving to us from [as far as] India, Afghanistan, and China to win the honor of martyrdom for the sake of Palestine … You might be surprised to learn that hundreds of Englishmen expressed their wish to volunteer in the Arab armies to fight the Jews. "I warned the Jewish leaders I met in London to desist from their policy, telling them that the Arab was the mightiest of soldiers and the day he draws his weapon, he will not lay it down until firing the last bullet in the battle, and we will fire the last shot …"
He [Azzam] ended his conversation with me by saying: "I foresee the consequences of this bloody war. I see before me its horrible battles. I can picture its dead, injured, and victims … But my conscience is clear … For we are not attacking but defending ourselves, and we are not aggressors but defenders against an aggression! …"
David Barnett, an international studies major, is a junior at Johns Hopkins University. He has been an intern at the Foundation for Defense of Democracies as well as a researcher and Emerson Fellow for StandWithUs. Efraim Karsh is director of the Middle East Forum and editor of the Middle East Quarterly. See, for example, Rony E. Gabbay, A Political Study of the Arab-Jewish Conflict: The Arab Refugee Problem (A Case Study) (Geneva: Librairie E. Droz, 1959), p. 88; Joan Peters, From Time Immemorial: The Origins of the Arab-Jewish Conflict over Palestine (New York: Harper and Row, 1984), p. 444, n. 14. See, for example, John Roy Carlson, Cairo to Damascus (New York: Knopf, 1951), p. 266; Mizra Khan, "The Arab Refugees—A Study in Frustration," in Walter Z. Laqueur, ed., The Middle East in Transition: Studies in Contemporary History (New York: Praeger, 1958), p. 237; Larry Collins and Dominique Lapierre, O Jerusalem! (New York: Simon and Schuster, 1972), pp. 408, 588; Esther Rosalind Cohen, Human Rights in the Israeli-Occupied Territories, 1967-1982 (Manchester, U.K.: Manchester University Press, 1985), p. 60, n. 72; Mitchell Bard, Myths and Facts: A Guide to the Arab-Israeli Conflict (Chevy Chase, Md. : American-Israeli Cooperative Enterprise, 2006), p. 121. Isidor Feinstein Stone, This Is Israel (New York: Boni and Gaer, 1948), p. 21. Alexander H. Joffe and Asaf Romirowsky, "A Tale of Two Galloways: Notes on the Early History of UNRWA and Zionist Historiography," Middle Eastern Studies, Sept. 2010, p. 671. New Haven and London: Yale University Press, 2010. Benny Morris, "Revisionism on the West Bank," The National Interest, July-Aug. 2010, pp. 76-7. Stone, This Is Israel, p. 21. "Acts of Aggression Provoked, Committed, and Prepared by Arab States in Concert with the Palestine Arab Higher Committee against the Jewish Population of Palestine in an Attempt to Alter by Force the Settlement Envisaged by the General Assembly's Resolution on the Future Government of Palestine," memorandum submitted by the Jewish Agency for Palestine to the United Nations Palestine Commission, Feb. 2, 1948; Moshe Shertok, "Letter from the Jewish Agency for Palestine Dated 29 March 1948, Addressed to the Secretary-General Transmitting a Memorandum on Acts of Arab Aggression," UNSC, S/710, Apr. 5, 1948. For the Aley summit, see Karsh, Palestine Betrayed, pp. 87-9. Tatar is used loosely in Arabic to mean Mongol, a reference to the thirteenth-century invasions.—Eds. Azzam met with Eliahu Epstein, head of the Jewish Agency's Washington office, on June 18, 1947, and with David Horowitz and Aubrey (Abba) Eban, the Jewish Agency's liaison officers to the U.N. Special Committee on Palestine, on Sept. 15, 1947. In both meetings he sought to dissuade his interlocutors from pursuing their quest for statehood by using the Crusaders metaphor. See Karsh, Palestine Betrayed, pp. 92-5.—Eds. Related Topics: Arab-Israel conflict & diplomacy, History | David Barnett | Efraim Karsh | Fall 2011 MEQ receive the latest by email: subscribe to the free mef mailing list This text may be reposted or forwarded so long as it is presented as an integral whole with complete and accurate information provided about its author, date, place of publication, and original URL.